The Open-Air Bath is a part of the bath complex of Hajdúszoboszló. The Open-Air Bath is open from May till late autumn ensuring an opportunity for bathing, resting and entertainment for people of all ages. Life starts in the area of the open-air bath of Hajdúszoboszló with the open-air bath opening ceremony on May 1. The open-air bathing unit of Hungarospa awaits its guests till the end of September. The area of the bath is 30 hectares. On this area there are 13 pools offering bathing and other entertainment services for its visitors. These services include boating, paddle boating on the boating lake located within the area of the bath, moreover it is possible to play beach volley ball and even chess. 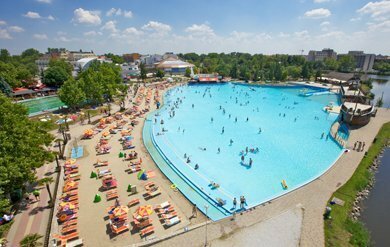 From among the 13 pools that are located in the area of the open-air bath the Wave Pool and the Bubble Pool are outstanding ones. The development that deserved the greatest attention in the course of the development of the open-air bath was the Mediterranean seaside, which is the largest built open-air pool of Europe. The sandy beach, the ship of the pirates, the lighthouse and the palm trees reflect the Mediterranean style. The swimming pool is available not only to those, who are fond of swimming, but it is also suitable for organising swimming competitions. The children may select from among several pools, where they may enjoy themselves in the water even under the supervision of the parents. The pool for little children, the pool for children, the training pool, and the omega pool with its two track chute offers an opportunity for careless entertainment. In addition to the water entertainment opportunities the adventures available in the open-air bath of Hajdúszoboszló are enriched by the playing ground of the little children. Within the area of the open-air bath the catering units of specific styles offer next to each other the meals of Hungarian gastronomy and the meals of the different nations. In order to enrich the water adventures Hungarospa organises different physical exercise programs, musical dancing and other entertainment programs as well.